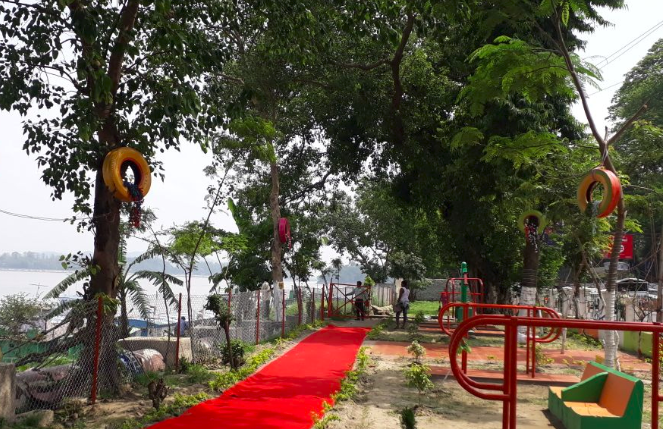 An open air gym was inaugurated in Mahabir Park, Fancy Bazar, Guwahati by Mayor (GMC) Mrigen Sarania on Friday, as part of the city beautification project by GMC. Commissioner Monalisa Goswami (GMC) was also present at the inauguration ceremony. This is only the start of the beautification project planned by the Guwahati Municipal Corporation (GMC). The measures also include plans to develop Judges field, Sonaram field and Gandhi Mandap, promoting several areas along the walking zone at Mahatma Gandhi road. The walking zone was opened last year and is thronged by people every Sunday. Apart from these stretches, the road from APSC office, Khanapara to Jayanagar will also be developed. The GMDA along with Guwahati Municipal Corporation also has plans to develop lighting, maintaining cleanliness and removing advertisement hoardings as a part of its beautification drive. Though the District Administration had taken up measures to decorate the city during the global business summit which took place in February this year, some of the newly installed decorations were damaged by miscreants.